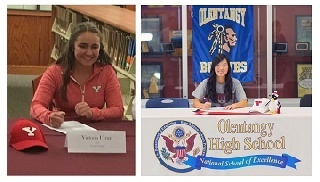 Youngstown State Head Women's Golf Coach Nate Miklos announced the signing of Tori Utrup (Walsh Jesuit High School) and Kara Raines (Olentangy High School) to National Letters of Intent. Both golfers will join the YSU program in the fall of 2017. Utrup, a native of Uniontown, Ohio, was a four-year letterwinner at Walsh Jesuit. Her career was highlighted by an appearance in the 2014 Ohio Division I State Championships where she placed 55th. She was a four-time District tournament qualifier playing while being consistently selected honorable mention all-district and first-team all-conference throughout her four years. Utrup finished tied for first in the NEOI Conference Tournament her junior year with a low score of 74 and finished fourth her senior year after carding an 81. She supported her team with and 81 scoring average her senior year where they won five tournament titles. Individually, Utrup finished in the top 10 in the 2016 USGA Junior Championship carding a 79 and had a low nine-hole score of a 35 and 38. Raines, a native of Galena, Ohio, tied for 22nd in her appearance at the 2015 Division I Ohio Girls Golf Championships. Raines carded a two-round 159 (84-75) at the even. She was the first golfer in Lewis Center Olentangy history to reach the state tournament. She was a two-time third-team all-district honoree as both a junior and senior and was a four-time second-team all-conference member four straight years. As a senior, she helped led the team to a school-record three tournament wins with the first being the Olentangy Classic where she shot a 75 and finished fourth. She holds the sophomore and junior school record for lowest 18-hole score and the senior and junior school record for nine holes. As a sophomore, she led her team to its first District Tournament since 2007 and only second time in school history. She qualified as individual for District tournament as a freshman, becoming the first freshman in the Central District to qualify as individual to the district event since 2008.